Anthony Peers is an architectural historian with a training in building conservation. In his work he engages with those proposing changes to historic buildings, providing evidence and guidance to ensure that schemes are planned from an informed standpoint. Anthony studied Art History as a Bachelor’s Degree at Manchester University and has an MA in Building Conservation from the Institute of Advanced Architectural Studies, University of York. In his first job in the historic buildings field, at SAVE Britain’s Heritage, Anthony wrote reports on buildings at risk and made a special study of military buildings. Following a spell working with English Heritage’s Listing Division Anthony travelled to Mumbai, India where at the behest of the British Council and Department of Trade and Industry he set up and ran an innovative programme to restore the Grade I Listed George Gilbert Scott designed University library and teach conservation philosophy and traditional repair techniques. Joining Rodney Melville & Partners (Architects) in 1998, and becoming an Associate in 2000, Anthony fulfilled the role of Architectural Historian for the practice dividing his time between the office, archives and libraries (undertaking documentary research) and site (recording and analysing historic fabric). Whilst in the practice’s employ he wrote thirteen Conservation Plans, incorporating detailed accounts of the historic evolution of buildings ranging from the Royal Institution in London and the Paine/Adam/MacVicar Anderson designed stables at Nostell Priory (Yorkshire) to the Museum of the Jewellery Quarter and the Barber Institute in Birmingham. In summer 2009 Anthony left Rodney Melville and Partners to focus on writing up the architectural history of Birmingham Town Hall. His book on this subject was launched in September 2012. Anthony has recently been working with Nick Cox Architects on projects at Winchester Cathedral and Kedleston Hall and has been providing guidance on the repair and re-use of farm buildings in the West Midlands. 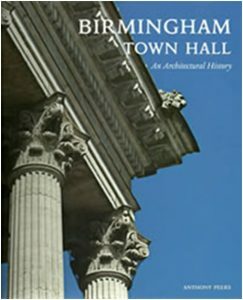 Anthony commenced his study of Birmingham Town Hall in 1999 when, then in the employ of Rodney Melville and Partners, he researched and compiled a report on the building’s history and significances. In addition to providing guidance to those planning the £35 Million scheme of works at the Town Hall (2005-7) Anthony also carried out an extensive programme of fabric recording whilst the building was being worked upon. The findings of this fabric recording and analysis, combined with the associated documentary research, provided the wealth of evidence upon which his book’s narrative is founded.